The restoration of Wildcat Reach is being undertaken by the Flagstaff Area Stream Team, a volunteer group coordinated byDavid McKee, City of Flagstaff Stormwater Dept. * The Stream Team is working with other City departments as well as Coconino County on this project. The purpose of the project is to initiate development of a restoration and preservation plan for this section of the Rio de Flag. 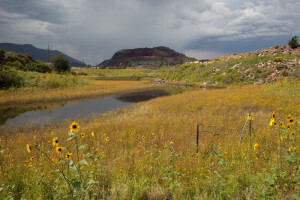 The goal is to restore this section to a properly functioning channel by reconnecting it to the floodplain; promoting plant diversity and reducing noxious weeds; preserving cultural heritage; improving the wildlife habitat; and adding interpretive education and recreational opportunities. 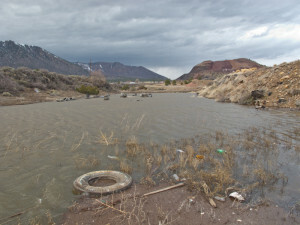 For years Wildcat Reach has been a dumping ground for industrial waster and a playground for paintballers. On October 22, 2011, a consortium of partner organizations sponsored a massive clean-up of the area. An amazing 8.2 tons of junk were removed. * The mission of the Flagstaff Area Stream Team is to identify opportunities for restoration, maintenance and preservation of streams, wash corridors and open channels within the city limits and take an active role in achieving these goals.